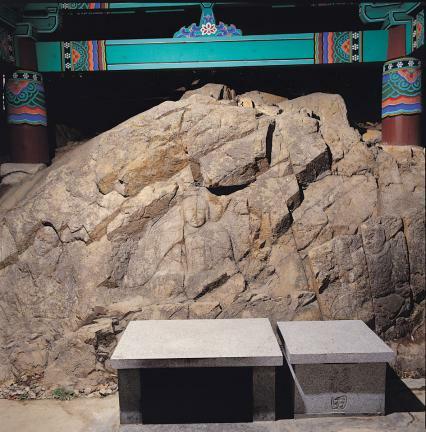 경주 낭산 서쪽 기슭의 바위면에 삼존불(三尊佛)이 조각되어 있는데, 표면이 거칠고 균열이 심한 상태이다. 가운데에는 머리광배와 몸광배를 갖춘 본존불이 있고, 양 옆으로 협시불이 있다. 본존불의 둥글고 양감있는 얼굴은 광대뼈가 튀어 나오고 살짝 미소를 띤 매우 독특한 모습이다. 본존은 머리에 두건을 쓰고 있고 양 어깨를 감싸고 입은 옷은 고려 불화에서 보이는 지장 보살의 모습과 비슷하여 흥미롭다. 양 협시는 본존과 거리를 두고 있는데 몸에 갑옷을 입고 있다. 왼쪽 협시는 오른손에 검을 들었고, 오른쪽 협시는 두 손에 무기를 들고 있는데, 악귀를 몰아내는 신장상을 표현한 것으로 보인다. 신라 문무대왕의 화장터로 전해지는 능지탑(陵只塔)이 이곳과 가까이 있는 점과 조각수법 등으로 볼 때 통일신라시대에 만들어진 것으로 추정된다. 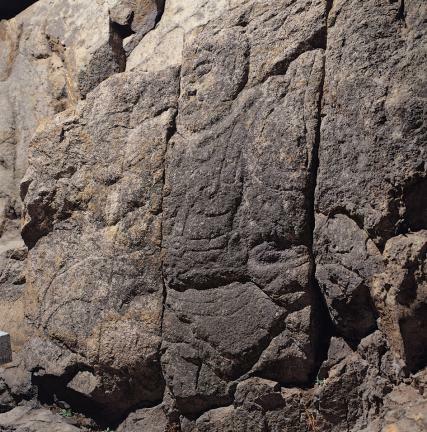 The Bodhisattva triad is carved on a rock at the western foot of Nangsan Mountain in Gyeongju. It has a rough surface and is seriously cracked. 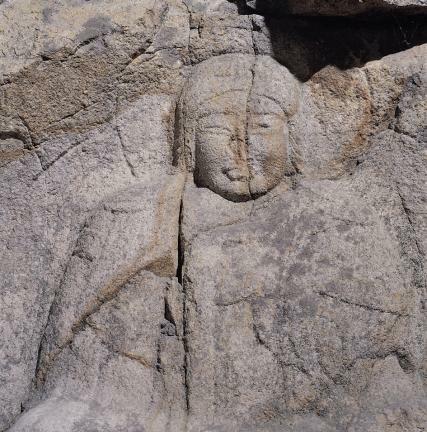 There is the principal Buddha with a brilliant head and body in the middle and attendants on each side. 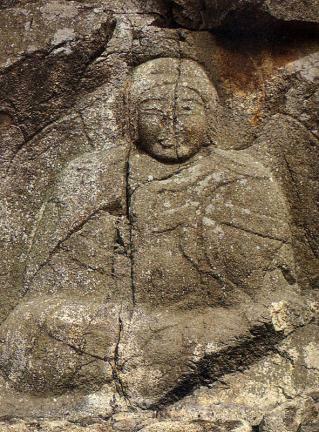 The principal Buddha wears a hempen hood and a robe similar to that of a monk wrapping both shoulders. 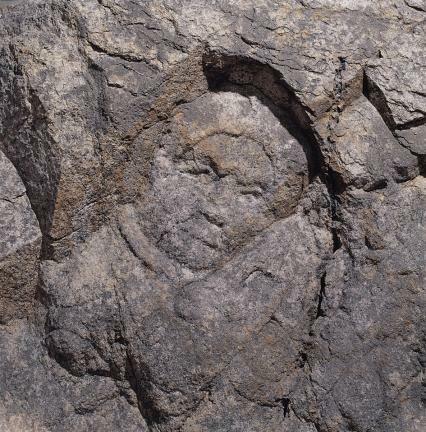 This is like the appearance of the Ksitigarbha Bodhisattva discovered in a Buddhist painting from Goryeo and it seems to have persisted into the contemporary style. Both attendants are armored and keep a distance from the principal Buddha. The left one has a sword in the right hand and the right one holds a weapon in both hands, which seems to have signified the guardian deity exorcising evil spirits. 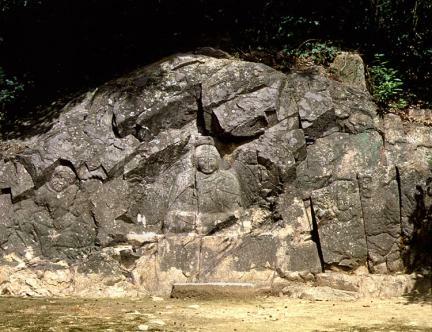 The carving is believed to have been made in the Unified Silla period, based on the carving skills and the fact that Neungji Pagoda, which is said to have been the crematory site of King Munmu of Silla, is nearby.